Before suffering the loss of his father, a young warrior is told of an approaching cataclysm that would again devastate human civilization. Tempered by the elements and burning with vengeful rage, Gideon Cole rises from the Heart of the Badlands to embark on a perilous journey through the unforgiving Wasteland, with the hope of vanquishing a god-like foe. It was time to put a stop to the desert warlord and his minions, take on the terrors that await him in the Valley of Nod, and battle his way through the city of Big Iron, to abolish the Master Program and set humanity free. 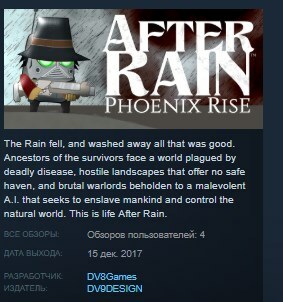 After Rain: Phoenix Rise is a 2D action-platformer set in the dark future, where the strong strive to see another day, and the weak are consumed by the Horde. The air is unbreathable, clean water is scarce, and bloodthirsty necrobots feast on the flesh of the living. It is now up to you to bring back all that was good. Lock 'n load, sharpen your blade, and prepare for the ultimate adventure!